Organizers of the clothing drive by the Indian American Catholic Association of Greater Philadelphia drop off the 28 packages of clothes to a Christian homeless shelter in Germantown. Members of the Indian American Catholic Association of Greater Philadelphia delivered 28 large boxes and bags of clothes on Saturday, Dec. 2 to benefit the Whosoever Gospel Mission, a Christian homeless shelter in Philadelphia’s Germantown section. 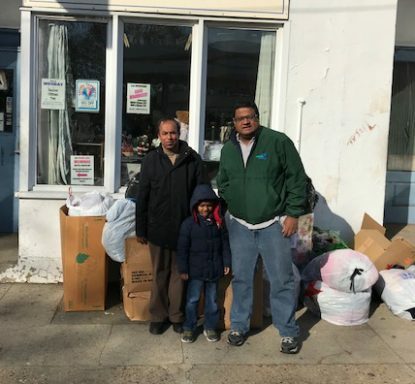 The clothing items were collected by the faithful of three Indian Catholic communities in the Philadelphia region, the Syro-Malankara, Knanaya and Latin rite. The Germantown shelter accommodates some 60 homeless people in a Christian environment with Bible studies and Sunday services. In addition, the homeless clients learn computer skills for about six to nine months until these individuals can find a job and move out of the shelter. The Indian faithful participating in the clothing drive gained a sense of gratitude for helping the homeless. Many wished to donate even more, which they did up until Dec. 10.